The Visual Arts Department at Mississippi School of the Arts invites you to a gallery exhibit in the Eva Vernon room at the Lincoln County Public Library, located adjacent to the school’s campus. “A Self-Portrait” exhibition is a showcase and portrayal of the individual. This year, we’ve included an audio tour of the gallery showcase. Using your internet capable smartphone, gallery visitors can scan a QR code (barcode) or enter a web URL to launch a special web site for the audio tour. 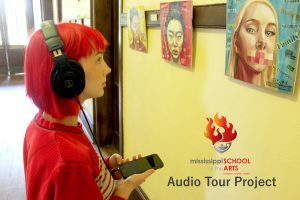 The audio tour will guide visitors through each piece, hearing the actual artist talk about their exhibit. The idea is to bring a closer connection between the artist and the viewer. Gallery Reception: Meet the artists at a visual arts reception on November 13th from 5:30pm until 6:30pm. The free art showcase will be available during opening hours at the public library, Monday through Thursday from 9am until 7pm, Friday and Saturday from 9am until 5pm. If you’re interested in the audio tour, please bring a set of earbuds or headphones for private listening.